If you are thinking about buying a home in Tallahassee, you better beware the trap that many overpriced home sellers hope to set for you. I always urge our buyers to read an article I wrote on How To Buy Overpriced Home Listings, but despite my best advice, they are still willing to walk into the trap, so I thought I would reiterate a few of the reasons to beware the over-priced home seller. The way most real estate contracts work, when buyer and seller have come to terms on a transaction, is that the buyer goes into a period of due diligence where they inspect the home and have it appraised. This period of time usually provides the homebuyer with ample opportunity to cancel the contract, so buyers feel as if they are "safe." And for the most part, they are. But they are not safe from wasting money. 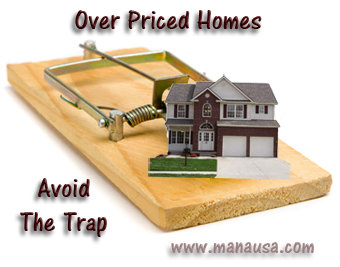 If a homebuyer finds an overpriced home and makes an emotional decision to purchase it, then they are stepping into a trap that is going to cost them money. Here's why. If the buyer makes an offer for what the home is really worth, the seller is going to say "NO." A Seller who is asking a price beyond what the home is worth is not receiving good advice from their real estate agent and is hoping to get an amount of money the current market will not bear. Thus, the offer will be ignored or countered, and then the buyer must either move on or walk into the trap. If the buyer is really infatuated with the home, then he must agree to pay a price above what the home is worth. Considering that most homebuyers in Tallahassee (not including investors who wouldn't even be looking at over-priced houses) are going to use a form of financing that requires little or no down payment, and herein lies the trap. An appraisal and home inspections will be ordered, thus committing the buyer to paying hundreds of dollars out of their pocket to see what the bank thinks about the deal. And now for the trap. When the appraisal comes in below the contract amount, the bank will only offer to finance against the appraisal amount. That means the differential (between the value of the home and the amount of the appraisal) must be handled by the buyer, the seller, or both. But now the seller has the buyer partially committed to the deal. The buyer can walk away from the money already spent, or come up with extra cash to over-pay for the home. In most cases, the seller is not motivated enough to sell the home at the real value, so the buyer is left, standing in a trap, and deciding what to do. Most walk away and are out the costs of proving to the seller that the house is over-priced. This way, the buyer only wastes time, not money in trying to buy an over-priced home. When the appraisal returns, the seller either needs to lower the price or the buyer should move-on and start looking at homes that are priced to sell in today's real estate market. Remember, roughly 60% of home sellers are failing to sell their homes right now, so buyers have great options. Over-paying for a home is not one that I would recommend. Can You Build A New Home Cheaper Than The Existing Homes For Sale? Is Realtor Value Only As Conduit To Realtor MLS?